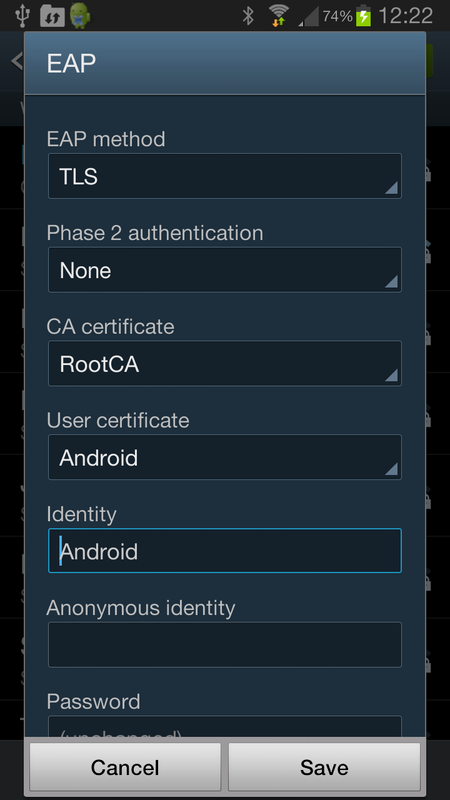 In this tutorial I want to demonstrate to you how to install a user certificate on an Android device so that you can authenticate to a wireless network using EAP-TLS. This is the most secure method of authentication when it comes to wireless networks but it requires some more effort as you require certificates on the server and each client device. If you don’t have a RADIUS server and Certificate Authority yet then you should take a look at my PEAP and EAP-TLS on Windows Server 2008 tutorial. In this tutorial I will be using a Windows Server 2008 machine running Certificate Services to generate a client certificate for my Android device. Certificate Authority: required to generate the user certificate. I’m using Windows Server 2008 R2. Windows computer: Used to request the user certificate for the Android device. I will be using Windows 7 in my example. The user certificate is required to authenticate the user, the root CA certificate is required in case you created your own certificate authority. We’ll start with the creation of a user certificate. First we will generate a user certificate for the Android device. I will use Windows 7 to connect to the Certificate Authority and request a user certificate. I will use Web enrollment for this as it’s probably the most convenient method of enrolling user certificates. Open the web browser and open http://your-server-ip/certsrv. 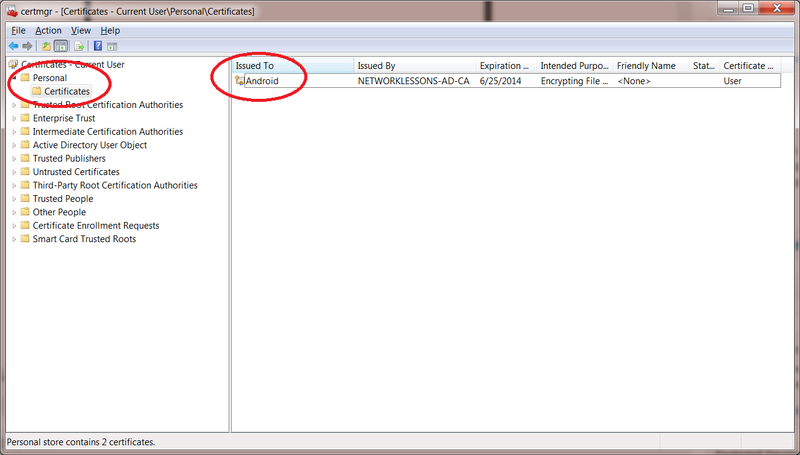 Enter the credentials of the user account that requires a certificate. I’m doing this for a user called “Android”. Click on the request a certificate button to continue. There is no need for advanced options, click on user certificate to continue. 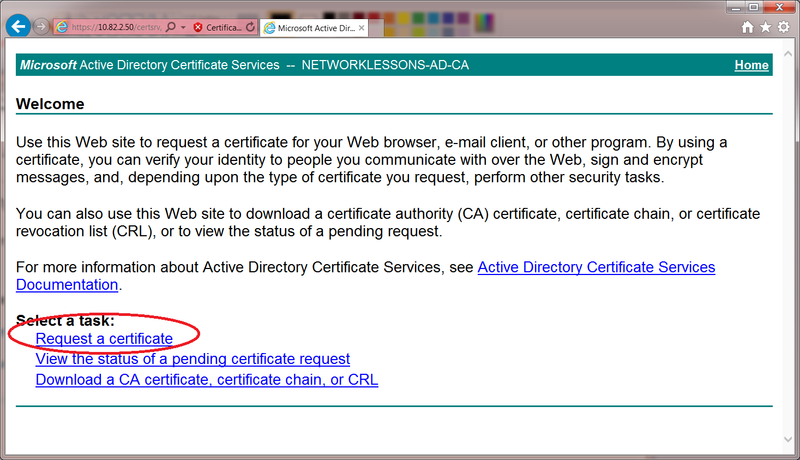 Your web browser will warn you that you are about to request a certificate, just click on Yes to continue. In the final screen the web enrollment is ready to submit your request. Hit the submit button to continue. Your user certificate will be ready and the web browser will ask if it should install the user certificate for you. 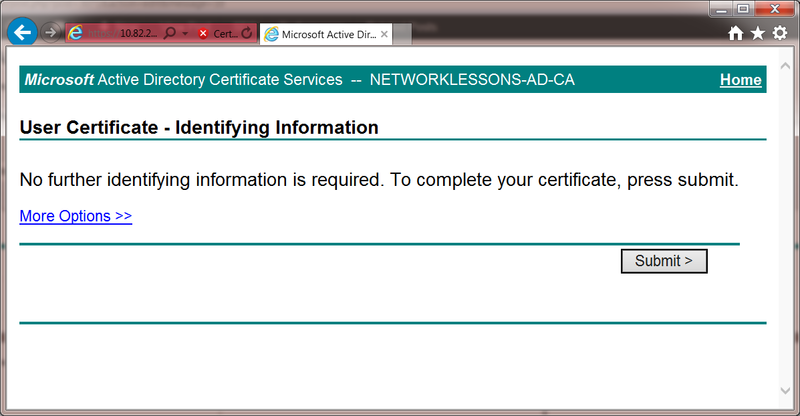 Click on Install this Certificate to continue. If everything went OK you should get a message that the user certificate has been installed. Now we have a user certificate on our Windows 7 computer. We will export this user certificate and import it to our Android device. 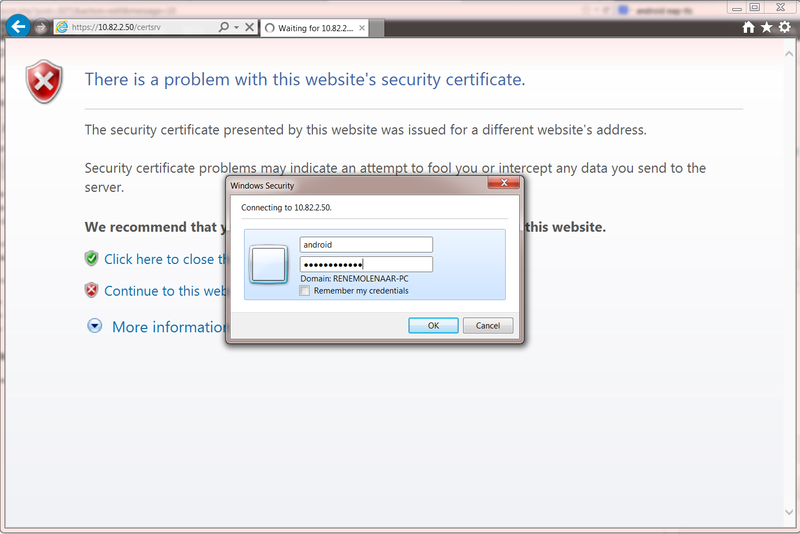 We will use the certificate manager on Windows 7 to view our certificates and export them. Click on Start > type “CERTMGR.MSC” (without the quotes) and hit enter. The Certificate manager will start. Click on Personal > Certificates and you will see the user certificate that we generated for the Android user. Click on the Android user certificate (right mouse click) and select Export. You will see the certificate export wizard, click Next to continue. The wizard will ask you to export the private key for the user certificate. Select Yes, export the private key and click Next to continue. In the next screen you will have to choose the file format. Everything is greyed out since this is a user certificate. 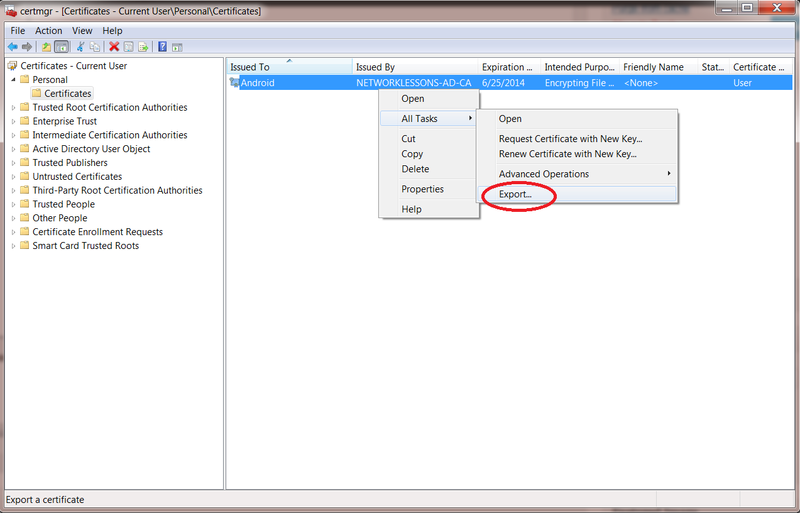 Make sure you select the “Include all certificates in the certification path if possible” and “Export all extended properties” checkboxes. Click Next to continue. The export wizard will ask you to protect the private key with a password. This is a good idea so make up a secure password and enter it. Click Next to continue. The export wizard will ask you for a filename. I’ll name my user certificate “Android”. Click Next to continue. Finally the export is done. Click Finish to continue. If you don’t have the root CA certificate yet you will have to export it from the certificate authority or from your Windows 7 computer. I already covered how to export the root CA in my other tutorial for installing PEAP and EAP-TLS on Windows Server 2008. Take a look at the Configure Wireless Client section to see how you can export the root CA to a filename. The user certificate in PFX file format. The root CA certificate in DER file format. We are now ready to import the certificates on our Android device. Most Android devices will only import certificates from an SD card (internal or external). 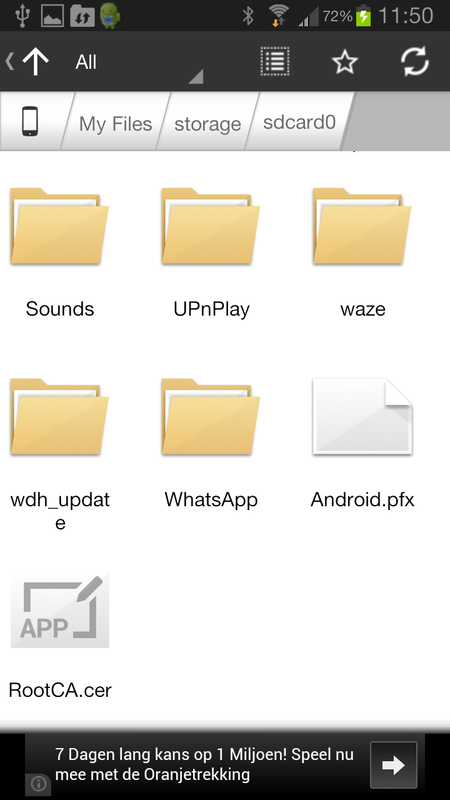 I am using a Samsung Galaxy S3 running Android 4.x but importing the certificates should be similar on other Android 4.x devices. 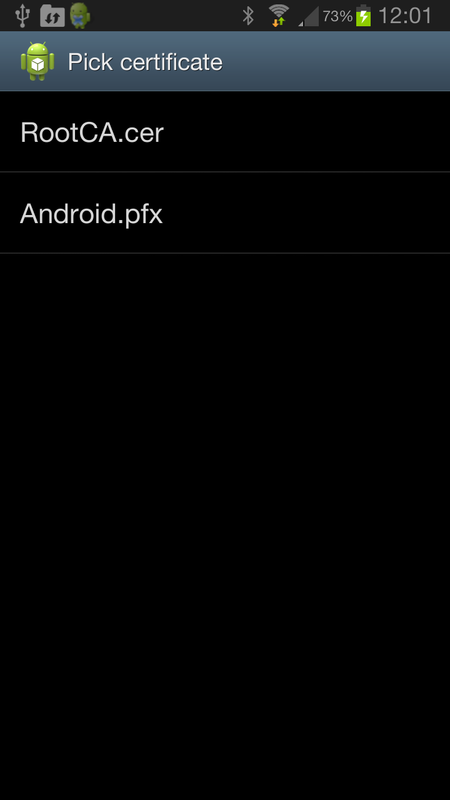 Some older Android versions might only recognize certain file formats. If your certificate are not recognized, try renaming the “cer” files to “crt” and the “pfx” file to “p12”. Once you have the files in place you import them. Go to the settings of your Android device. Select the Security option from the Settings menu. At the bottom you will find the Credentials storage. Select Install from storage device. 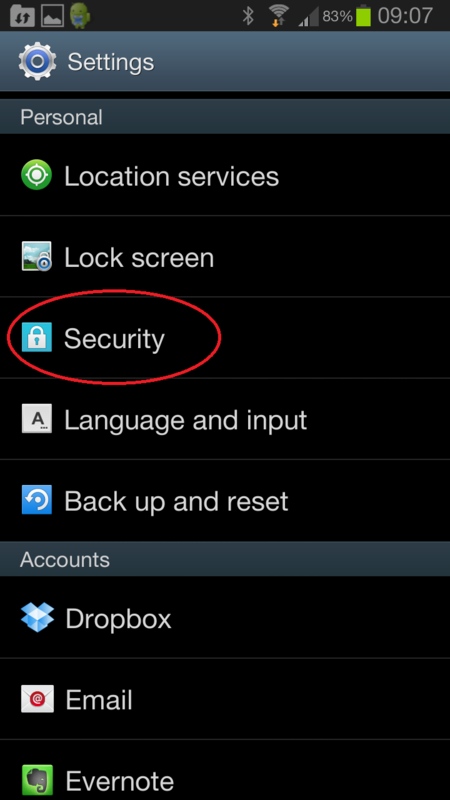 Your Android device will find the certificate files on your storage device and prompt you with the following screen. We need to install both, let me give you an example of the user certificate. Type in the password for the private key and hit OK. In case you get the error “No certificate file found on SD card” then A) your Android device doesn’t support the file format for the certificates that you copied or B) you copied the certificates to the wrong storage device. 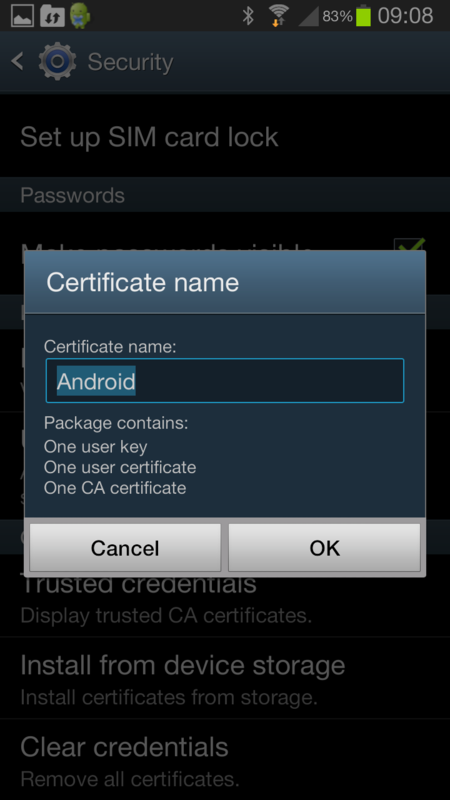 Android will ask you for a certificate name. Keep the default or rename it to something else and press OK.
Make sure you import both certificates. 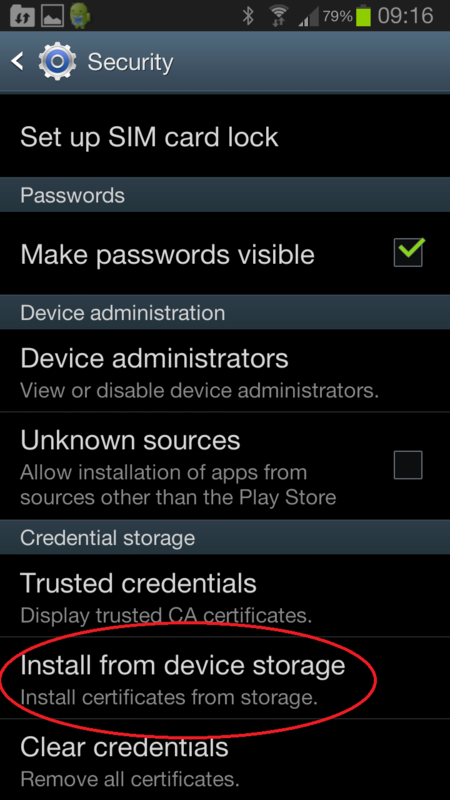 You can verify that your Android device recognizes the certificates. Select Trusted credentials if you want to take a look. Below you can see that this Android device has a user certificate. Our Android device now knows about the certificates that we require. Time to connect to the wireless network! CA certificate: your root CA. User certificate: your user certificate. Leave the rest of the items empty and press Save. That’s all there is to it! I hope this has been helpful to help you connect your Android devices to the Wireless network using EAP-TLS. If you have any questions feel free to leave a comment in our forum! Great post. Very informative. Two questions if I may; EAP-TLS user certificate was used in the above example but do you know if EAP-TLS machine certificate is possible? At my job we use EAP-TLS machine certificates for our computers but we would like to now extend EAP-TLS machine certificates to the Andriods. Also, in the example you launched the http://your-server-ip/certsrv from a computer then exported/imported to the Andriod, is it possible download/install the cert from http://your-server-ip/certsrv directly onto the Andriod or must the export/import step be used? 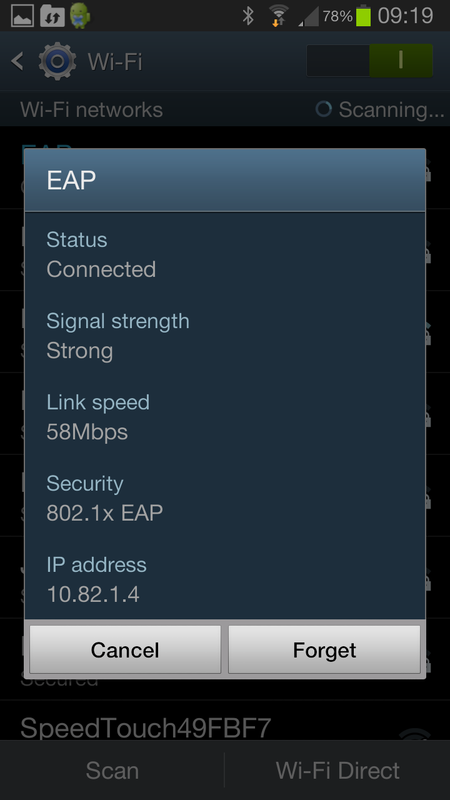 We usually create eap-peap supportted ssid’s, can we use the same ssid for eap-tls . In this example you are providing a username to connect to the ssid ? It is more secure to use a certificate for authentication rather than a username and password. This is because the security mechanisms involved are much more complex and more difficult to break. 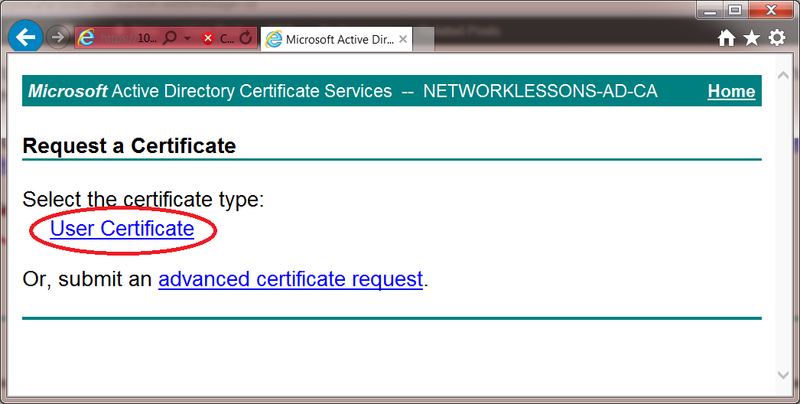 In the above example, only the certificate is used for authentication. The username is used just for identiy purposes, to indicate to who the certificate belongs.